Dallas Willard died today. That's what the news says anyway. But if you could talk to Dallas, I think you'd hear a different story. When he was diagnosed with pancreatic cancer in the late summer of 2012, one of his reflections was, "I think that, when I die, it might be some time until I know it." What he meant was that for the one who trusts and follows Jesus, death itself has no power to interrupt this life. Jesus himself said that the one who trusts in him will never taste death. Dallas was a philosophy professor at USC for nearly 50 years, where he specialized in philosophy of mind and logic. He was a profound author on spiritual formation, or the kingdom of God, or as he often called it, "the with-God life." He would often say that there are four great questions humans must answer: What is reality? What is the good life? Who is a good person? And how do you become a good person? And his concern was to answer those questions, and live the answers. And he was simply convinced that no one has ever answered them as well as Jesus. 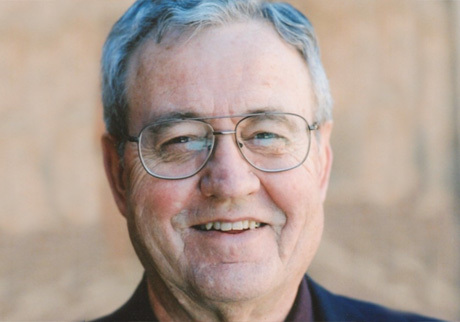 Dallas Willard combined a rigorous intellect with a warm heart. He was sincerely interested in people. He was loving and respectful to others, even those who were not loving and respectful to him. He spoke with the slow cadence of a southern preacher, but his words belied a man who had digested thousands of books. (He had four personal libraries of books including his home, his second home, his school office, and a garage). He was honest and authentic. He would say, "If you could find a better way, Jesus would be the first one to tell you to take it. And if you don't believe that about him, you don't have faith in him, because what you're really saying is that he would encourage you to believe something that is false." I’ll never forget one thing that happened during one of Dallas’ classes. He had been explaining what it means to live in the kingdom of God, when a member of the class shot up a hand. When I saw who had a question, I cringed. This man lived on the edge of sanity, as did many of the street people who attended Hollywood Pres. From experience, I knew that his question would be a distraction from the point. Sure enough, the man asked a question that asked Dallas to explain something he had just finished explaining. It was asked in a way that insinuated Dallas was misunderstanding the Bible. As the questioner droned on, the tension in the room – and in my stomach – grew. Dallas listened patiently, gazing intently at the man with the question. Then he responded. I can’t remember his exact words, but I do remember the way in which Dallas answered this man. He spoke with deep respect for the man and his question. Dallas did not take offense at the way the question had been asked. Rather, after thanking the man for his question, Dallas explained what he had said earlier with clarity and greater simplicity. He seemed eager to help the questioner understand the answer. But, even more striking was Dallas’ obvious desire to offer deep love and respect to this man who was, in many ways, a misfit. Willard was quietly subversive of nominal Christianity, always encouraging people to see the grand vision of discipleship that Jesus intended for His followers to embark upon. His impact his hard to overestimate. He was a significant influence in a renaissance of evangelical thinkers in contemporary academic philosophy. In fact, three of the five philosophy professors at Talbot School of Theology were Willard's students. He has been a mentor and friend to many of the most influential evangelical Christians of our time. And countless others have benefited from his writings and teachings. Although I've never met Dallas Willard, I've heard him speak live a number of times, and I feel as though I've had dozens of conversations with him. He is one of the few people (who has written more than one book) of whom I can say that I have read all of his books--with the exception of one. (I tried to read his advanced philosophical work, Logic and the Objectivity of Knowledge, but quickly realized that I lacked the requisite philosophical training). But without ever having met me, Dallas Willard mentored me. He's one of seven men I would count to be my mentors. Through his various writings and teachings I learned from him things too valuable to repay. Our communion with God provides the appropriate context for communications between us and Him. To try to locate communication within human existence alienated from God is to return to idolatry, where God is there for our use. To try to solve all our life's problems by getting a word from the Lord is to hide from life and from the dignity of the role God intended us to have in creation. In his book, The Spirit of the Disciplines, Dallas taught me to understand the nature and importance of spiritual disciplines for the Christian life. He helped me to understand that being a disciple is learning to live life as Jesus would live it if he were in my place. And he helped me to understand that discipleship is simply what it means to be a Christian--it's not just for "super-Christians." In his book, The Divine Conspiracy, Dallas helped me to see the genius of Jesus' instruction manual for life in His kingdom--the Sermon on the Mount. He helped me to see that the gospel is not merely a way to manage sin, but rather is an invitation to an entirely new kind of life--the eternal kind of life that he enjoyed on earth and is still enjoying. He helped me to understand the value in slowing down and living a simple, unhurried lifestyle, with a genuine awareness of God's presence and kingdom. His book The Renovation of the Heart helped me to understand who I am, how I change, and how to become the kind of person Jesus is. He helped me understand character--that the choices I make have real consequences in my soul and I was becoming a certain kind of person. He helped me understand the nature of my own soul, my propensity towards sin, and the provision God has made for my transformation so that I truly can put on the character of Christ and experience genuine growth and maturation. His book Knowing Christ Today helped me understand the importance of spiritual knowledge for all of life. And finally, his book The Great Omission gave me a larger vision of discipleship. I've also been shaped by numerous other articles he's written and talks he's given. Dallas Willard has made a profound impact on my life, and he will continue to mentor me as I reread his books and listen to his teachings. Although I don't agree with everything he wrote, I've been forever sharpened by interacting with his thoughts. It's been a great conversation--one I'd encourage you to enter into--and one day it will continue in person. I look forward to the day that I'll meet my mentor. For more on Dallas Willard, see John Ortberg's excellent tribute to him.